February 9, 2017 (Washington D.C.) – The Senate yesterday confirmed Alabama Senator Jeffrey Sessions as Attorney General on a 52-47 vote, with just one Democrat crossing the aisle to vote with the Republican majority. Senate leader Mitch McConnell drew criticism for rebuking progressive Senator Elizabeth Warren, shutting down her testimony and preventing her from reading a letter from Coretta Scott King, widow of Martin Luther King, Jr. In the 1986 letter, King objected to Sessions’ nomination for a federal judgeship . Her letter stated that Sessions abused "the awesome power of his office to chill the free exercise of the vote by black citizens in the district he now seeks to serve as a federal judge." Three male Democratic Senators later read the letter, in which King pointed out Session’s voting fraud prosecutions of civil rights advocates who helped register African-Americans to vote, the Boston Globe reported. The defendants were acquitted by a jury. Back in 1986, the Senate opted not to confirm Sessions as a judge due to evidence that he opposed civil and voting rights. But yesterday, the Trump nominee won confirmation to serve as the highest law enforcement officer in the land. You are kidding right? This man was one of the FIRST judges in the ENTIRE COUNTRY to have sent a KKK member to the death penalty. Anyone against his confirmation is a racist. Yes, he did get a conviction against a KKK leader in a murder case. In 1975, he served as an Assistant U.S. Attorney for the Southern District of Alabama. In 1981, President Reagan nominated him to become U.S. Attorney for the Southern District. He was confirmed by the Senate and held the post 12 years. During that time, he investigated the murder of Michael Donald, a black teen hung by Ku Klux Klan members. Both men were arrested and convicted; Sessions obtained a death penalty sentence for one of the killers in a case that reportedly broke the backbone of the KKK in Alabama. But when Reagan nominated Sessions in 1986 to become a judge on the U.S. District Court, his nomination was blocked with two Republican Senators joining Democrats on the Judiciary Committee. His nomination was opposed by the NAACP and the Leadership Conference on Civil Rights. Four Justice Dept. lawyers testified that Sessions made racially offensive remarks. Kowalski also said Sessions was more welcoming of Civil Rights Division work than many other southern federal lawyers in that era. 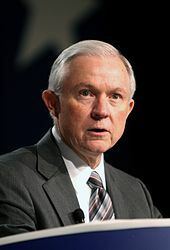 However, Figures contradicted that depiction, saying he once heard Sessions throw a civil rights case file on the table and say “I wish I could decline on all of them.” He reported opposed the Voting Rights Act, which as U.S. Attorney General he would be sworn to uphold. In his testimony to the Judiciary, Sessions defended his civil rights record and noted that the signed 10 pleadings attacking segregation or its remnants. Perhaps most troubling to committee members, Sessions was accused of falsely prosecuting black political activists in Alabama for voting fraud, including a member of Rev. Martin Luther King’s staff. The activists had collected and mailed 500 absentee ballots for elderly black voters. The trio known as the Marion Three were accused of altering absentee ballots, mail fraud, and conspiracy to vote more than once, but were acquitted by five whites and seven black jurors. The Tuscaloosa News, however, reported that Perry County, Alabama, where the case originated, had faced allegations of voting fraud for decades and in 2012, Uniontown had a population of 1,775 in the2010 census but by 2012 had 2,587 registered voters. Sessions has contended that he was right to try the case, but simply failed to provide enough proof to win. Reagan ultimately withdrew the judicial nomination. However, Sessions went on to be elected Attorney General of Alabama in 1994 and won election to the U.S. Senate in 1996. In the Senate, he often received an “F” from the NAACP and other civil rights groups for opposing civil rights bills. In 2013, he praised the Supreme Court for essentially gutting the Voting Rights Act and allowing states with histories of discrimination to change their voting laws, no longer needed federal oversight. That decision led to a flurry of new laws passed by states that had the effect of suppressing minority votes, such as Alabama, which passed voter photo ID requirements and then promptly shut down 31 DMV offices in counties that were predominantly black.